Come February 10, when the townsfolk of Bacolor go to the San Guillermo Parish Church for their fiesta celebration, they will enter the worship place through the upper windows, as what they have been doing the past 28 years since Mt. Pinatubo erupted and altered their lives in ways they never imagined. Rebuilt in 1886, the structure is now literally half of its previous glory.The church’s bottom half is buried under six meters of lahar that swallowed the town and most of the province. It still serves the town’s faithful who access the building through what used to be second windows converted into doorways. Solidum was already serving the agency when Mt. Pinatubo woke up from her 500-year slumber in 1991 following a 7.7 magnitude earthquake that shook northern parts of the country a year earlier. The eruption of the then little known volcano destroyed or damaged houses, farmlands and infrastructure and claimed the lives of dozens of people and displaced hundreds of thousands of families. It was one of the world’s largest volcanic eruptions in the past century, geologists say. Much of that was dumped on the slopes of the volcano. Pyroclastic flows easily overran the slopes of Pinatubo, engulfing gullies as deep as 200 meters. “What I imagined was Mt. Mayon. We will watch it from afar. We would watch a trickle of glowing lavas and we will take pictures from a safe distance,” recalled Tantingco, who was then 31 years old. Tantingco stayed in the family home by himself after his family evacuated to Baguio City, about 155 kilometers away, shortly after the eruption. Eventually his father came home, and then his mother. After a while, even the little ones came home. Lahar flows buried half of the San Guillermo Parish Church as well as the Bamban Bridge in the North Luzon Expressway. Unfortunately, the lahars didn’t stay on the slopes. In the years following the eruption, seasonal monsoon rains eroded lahar deposits and carried them down to the lowlands – Pampanga, Tarlac and Zambales. Bacolor’s original name was Bakulud, a Kapampangan word meaning high ground. As it turns out, Bacolor is elevated ground precisely because pyroclastic materials from Pinatubo is routinely dumped over the area, piling up over the years. A truck hauls so-called Pinatubo sand from the riverbed of the Sto. Tomas River in Bataan. A viewing deck was built on the edge of Mt Pinatubo's caldera to provide tourists a better view of Crater Lake. Ash from Pinatubo now forms the wall of the gorge where the Tarlac River. Mt Pinatubo eruption. File photo from Phivolcs. The stillness of Mapanuepe Lake is belies the tragedy that it is borne out of. These lakes are as much as worry for scientists as rampaging lahars. Eventually the exit to the Marella River got plugged, drowning the adjacent communities. Today, the sole reminder of the former barangay is the church steeple jutting out of middle of the lake. “They cannibalized each other during the Mt Pinatubo eruption. The alteration of the slopes was so extreme the rivers were diverted one day then they were back the next day,” Tantingco, the local historian, said. “People in the lowlands don’t know when the lahars are going to come. One day the lahars are flowing in Sacobia, the next day they are flowing in Abacan because they keep cannibalizing each other,” Tantingco explained. Longitudinal profile of the Sacobia-Bamban River, starting at 350 m in elevation, 12 km from the summit of Mount Pinatubo, and extending down to less than 50m in elevation. 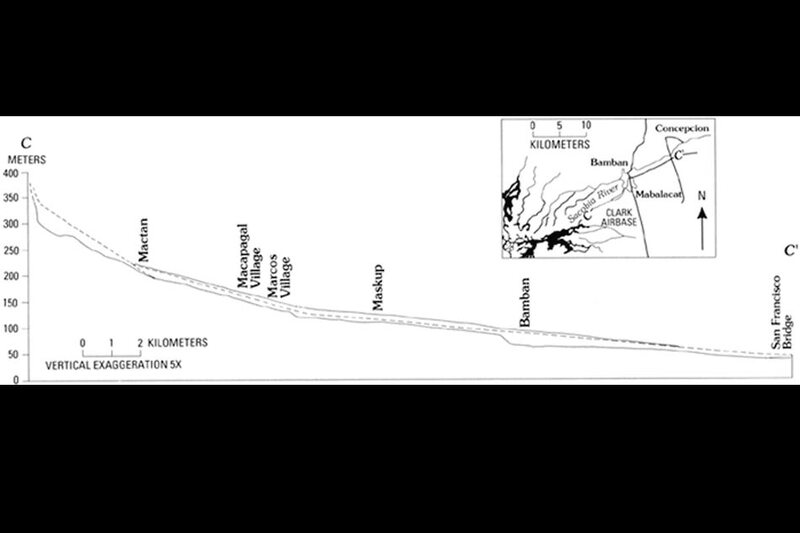 Preeruption profile is shown by the lower solid line; 1991 lahar deposit by the dashed line; 1992 lahar deposit by the upper solid line. Note that vertical exaggeration is 5x and that only the lower, gently-sloping reaches of the Sacobia are shown. The local governments of Pampanga have since reconstructed land titles for private land especially in population centers. Some were able to rebuild over the property they lost and pick up almost where they left off. Others – sometimes whole communities – had to relocate to settlements designated by government. Following the eruption and the lahars, government undertook hazard mapping to determine which areas are safe for habitation. Some of the original settlements now fall within danger zones. Pinatubo has gone back asleep since then. The mega dike, however, claimed more victims when a section of the dike collapsed, drowning three towns and resulting in a loss of P38.9 million for the government. The last bad lahar flow was in 1998 but overall, residual threats from the last eruption are low. Remnants of prehistoric eruptions are evident in what is known as Porac sand - fine sand popular in the construction industry and found abundantly and quarried openly along Pampanga’s riverbeds. Quarry operations contribute as much as P40 million daily to the province’s earnings and employing thousands of locals.